Chief Anita Tyrrell Brown parks at Bolinas’ new firehouse. The new station, which replaces one that was not earthquake safe, had been in the works for more than eight years. It has now been in use for almost a week. Scores of people showed up Sunday for a grand-opening party for the firehouse and adjoining medical clinic. 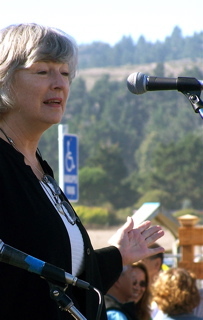 Congresswoman Lynn Woolsey Sunday told a grand-opening crowd that community clinics are a key to providing the United States with universal health care. Retired Dr. John Doss of Bolinas and (balancing on a concrete bar) photographer Art Rogers of Point Reyes Station. 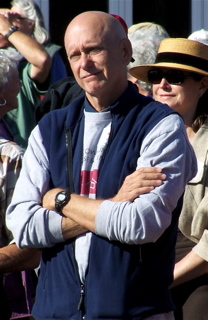 The new Bolinas Clinic is in the background. To the left is the south side of the new firehouse. 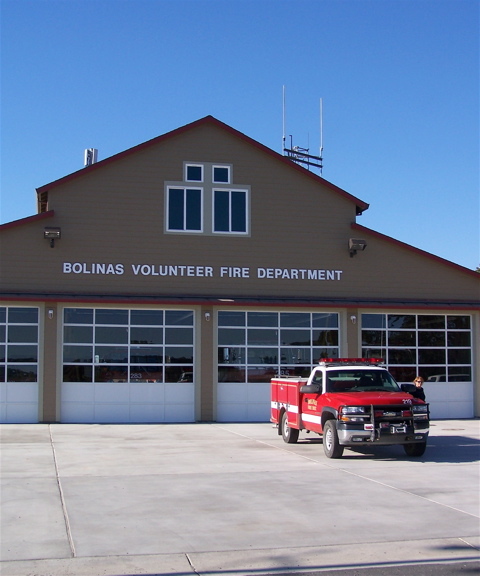 Supervisor Steve Kinsey described the firehouse-clinic project as an example of cooperation between county government, which provided about $450,000, and the community of Bolinas. The new clinic, part of the nonprofit Coastal Health Alliance, went into service last week. Handling the front desk is Sharon Lee. 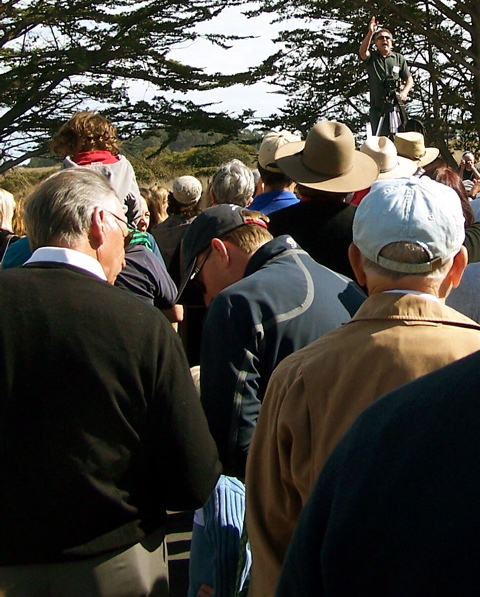 Bolinas resident Mark Buell, who played a key role in fundraising, happily addressed Sunday’s throng. The firehouse and clinic project cost approximately $6.57 million. Kim Bender of Bolinas, who has been directing the fundraising, reported half the money came from public sources and half from private and community sources. 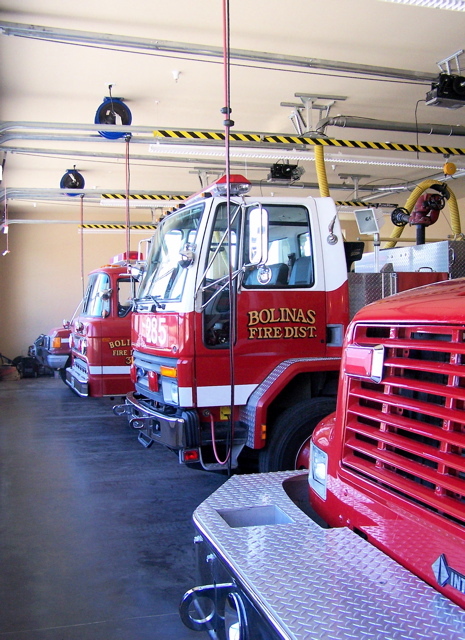 Public sources: Bolinas Fire Protection District parcel tax, $1.73 million; California Health Facilities Finance Administration (CHA), $750,000; County of Marin, $442,000; Fire Protection District operating funds, $237,000; other state and county grants, $108,000. Private and community sources: individuals, $1.2 million; Marin Community Foundation, $1 million; Fire Protection District bonds, $555,000; CHA mortgage, $300,000; Tides Foundation, $200,000; other foundations, $50,000. Fundraising is still underway to repay $550,000 in loans, Bender said. Checks can be sent to Bolinas Firehouse & Clinic Project, Box 126, Bolinas, California, 94924. Contributions can also be made online at the project’s website. Photographer Art Rogers (on a ladder at upper right) arranges Sunday’s crowd at the Bolinas Firehouse and Clinic opening before taking a portrait for his Point Reyes Family Album. While he is best known in West Marin for that collection of photos, he achieved international recognition four years ago when he photographed 50 women lying naked on Love Field in Point Reyes Station, spelling out PEACE with their bodies. Sunday he declined a suggestion to have the crowd take off their clothes, lie down, and spell out FIRE. 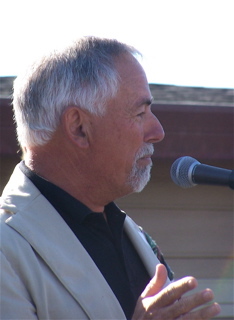 Tom Peters, president of Marin Community Foundation, congratulated Bolinas residents for working together to create the firehouse and clinic project. 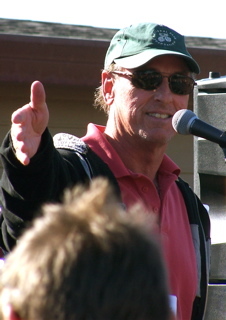 The foundation has donated $1 million. The new complex is on Mesa Road. 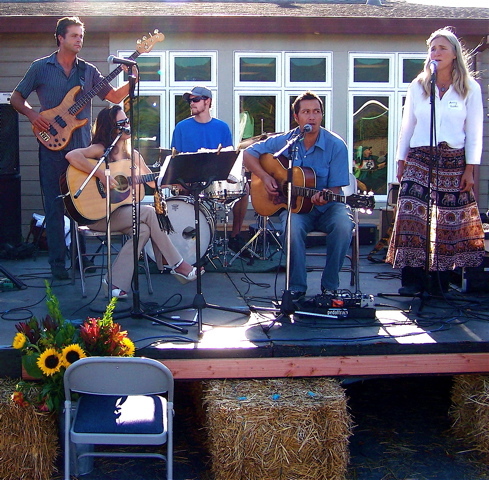 In the lee of the new firehouse, the Fireflies (pictured), Bolinas Stinson School Singers, and Don Tshoot The Piano Player entertained the grand-opening-party crowd. 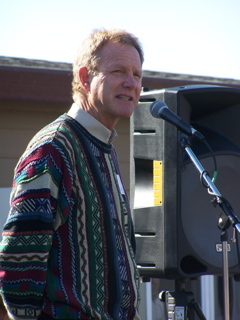 Among those listening to Sunday’s speakers was Dr. Michael Witte, medical director of the Coastal Health Alliance, which operates the clinic in Bolinas as well as clinics in Point Reyes Station and Stinson Beach. 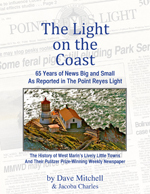 The Bolinas Clinic previously operated out of a tiny office on Wharf Road. New firehouse with four fire engines in its bays. The firehouse, which will eventually be equipped for an ambulance, includes dormitory rooms, a meeting room, offices, a dayroom and kitchen, and facilities for washing firefighters’ contaminated garb. Congratulations on these new community service buildings. 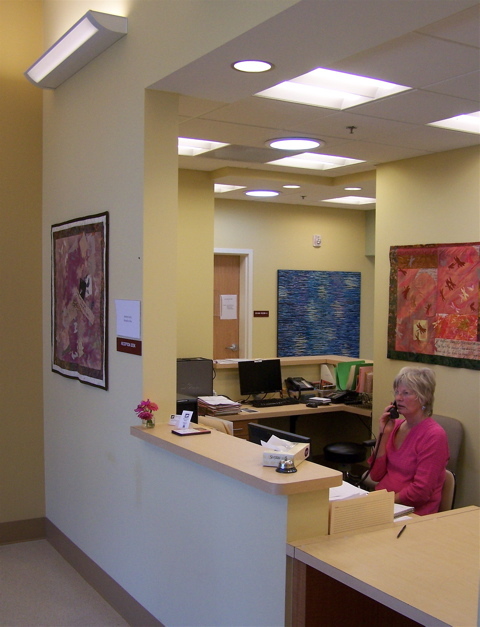 Your photos and coverage are informative with one exception: You omitted names and photos of the clinic nurse practitioner, Dale Johnson (whom I understand founded the clinic some 25 years ago), and other staff who make the clinic services happen. I believe Dale has also been active in fund raising as well. Any chance you can do some amending of your report? Thank you for your comment, especially the information about Dale Johnson. 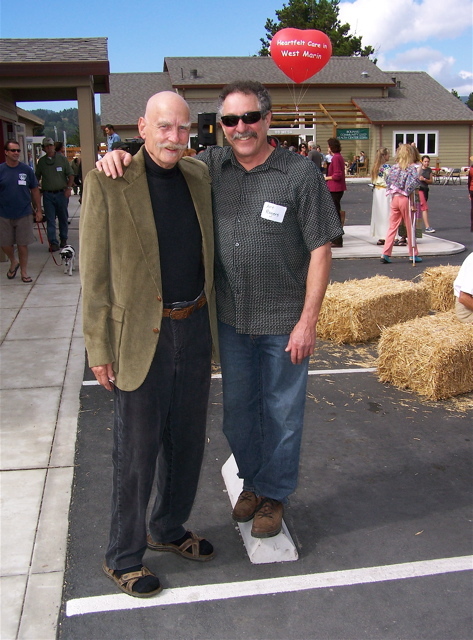 The posting was a merely a look at the grand-opening party for the new Bolinas firehouse and clinic. I agree with you, there is much more that could be said about the history of the clinic and its staff, as well as about the firehouse and its volunteer firefighters. If others want to add information, it too can be included here. Thank you, Dave. Your record keeping is appreciated. I found this post not only useful, but much more exciting than board minutes. Sparsely Sage and Timely is powered by	WordPress 4.9.10 and delivered to you in 0.348 seconds using 55 queries.